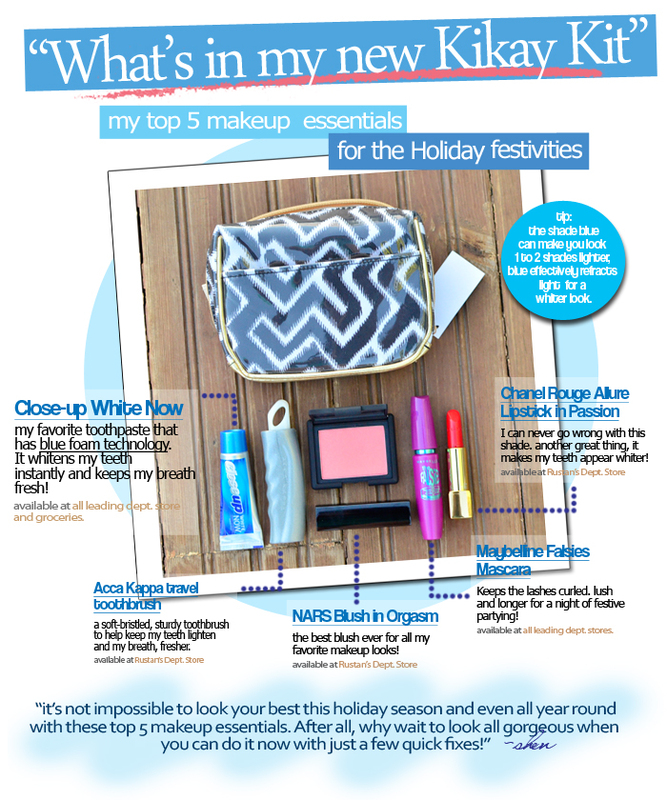 The Uncurated Life: Top 5 Makeup Essentials in My New Kikay Kit! Top 5 Makeup Essentials in My New Kikay Kit! Exactly how I feel this Holiday and almost everyday, actually. I feel as if I'm always pressed for time and always rushing to somewhere. With all the parties to go to while work isn't halting one bit, I have stretched myself far too much. That's why quick fixes to me are very important. Like cleansing juices since I can't be bothered to prepare healthy meals. Spot treatment for my pimples since I barely have time to visit a derma. Quick facials like from flawless. Another great quick fix is using Close-Up White Now toothpaste. I've been using it for more than a year now and it never failed to give me instant white teeth and fresh breath. My dentist is always impressed on how well I maintain them and I don't even floss regularly! I may not have the pearly whites you see on models but given my propensity for stress and social smoking as well as soda and coffee, my teeth is looking great. Sure sign that this toothpaste is working. Must be because of the blue foam technology that instantly provides an optical illusion, making the teeth appear whiter than it already is...and of course, fluoride! Think of Close-Up White Now as a highlighter but for your teeth! It gives that instantly glow that we badly need! A great time-saver for us busybodies!